Not to be confused with Leeward Islands. The Leeward Antilles (Dutch: Benedenwindse Eilanden) are a chain of islands in the Caribbean – specifically, the southerly islands of the Lesser Antilles (and, in turn, the Antilles and the West Indies) along the southeastern fringe of the Caribbean Sea, just north of the Venezuelan coast of the South American mainland. The Leeward Antilles, while among the Lesser Antilles, are not to be confused with the Leeward Islands (also of the Lesser Antilles) to the northeast. Largely lacking in volcanic activity, the Leeward Antilles island arc occurs along the deformed southern edge of the Caribbean Plate and was formed by the plate’s subduction under the South American Plate. 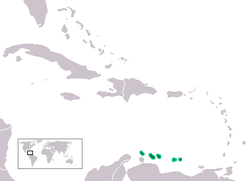 Recent studies indicate that the Leeward Antilles are accreting to South America.